bhavanagari chillies recipes. These are special varieties of chillies that are grown only in Bhavnagar in Gujarat. They vary a little in size but are mostly wider at the stem end and tapering at the bottom. Even though a specialty of Gujarat, they are available all year round throughout the country. They are not the spiciest but are moderate to high spicy. Due to their unique taste, they can be used for pickling, tempering or used in a vegetable preparation. An easy snack recipe that is best enjoyed on a rainy day with a steaming hot cup of tea is Bharwan Paneer Chilli Pakoda. Here the chilies are slit, deseeded and stuffed with a delectable paneer mixture, coated with a besan batter and then deep fried to perfection. It's not even necessary to stuff the chillies! You can just deep fry them coated in besan batter and they’ll still taste delicious. Mirchi vadas are a common evening snack in Gujarat, so much so that people go there especially to eat these. It's not even necessary to coat these bhajiyas in batter, you can simply stuff them with things like moong dal spiced with cumin seeds, onions, hing, deep fry them and make Bharela Moong Dal marcha. These chilies are an excellent accompaniment to all kinds of meals. It is very common to pickle the chilies or simply fry them, sprinkle them with a salt and eat them to lunch or dinner. Typical way of eating Bhavanagri Marcha, like in Gujarat, is to cut them in roundels and toss it with a little turmeric, black salt and hing. Raiwala Marcha is also an excellent pickle to eat with roti subzi. Mirch ka Salan is a subzi made with bhavanagri chillies in a gravy of peanuts, ginger, garlic and numerous whole spices. This Hyderabadi special subzi is a crowd pleaser for entertaining guests when you want to make something absolutely unique! 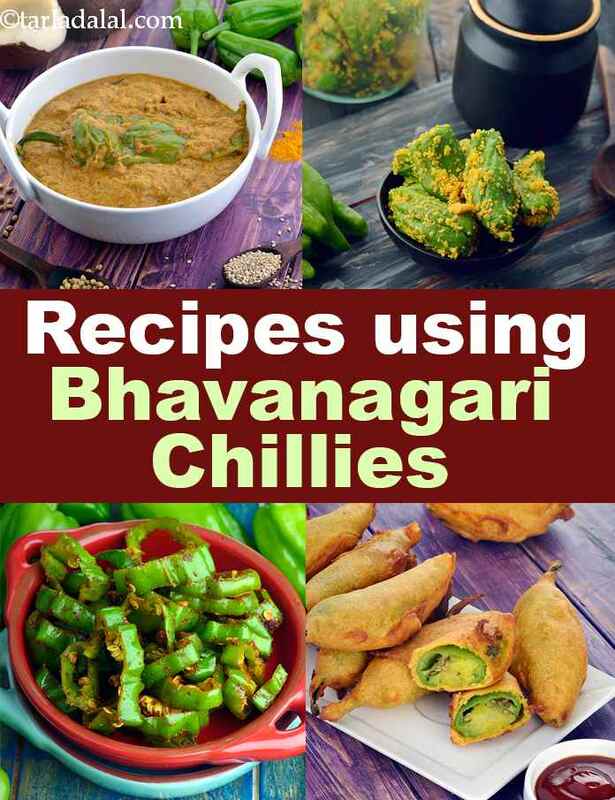 Enjoy our bhavanagari chillies recipes collection. The addition of crunchy baby corn and creamy soft paneer enhance the flavours and provide an interesting new twist to the recipe of Salan. The sweet and spicy flavours marry to make a very filling and tasty main dish that requires only rotis or parathas alongside. A fiery combination of green chillies, which are a rich source of vitamin c, and calcium-rich jeera. Hari mirch Jaipuri is a delicious recipe of hari mirch( green chillies) enrobed in a delectable spicy masala cooked in a typical Jaipuri or Rajasthani style. Serve the hari mirch vegetable with steamed rice and lentil curry or dals. This can be used as side dish with plain rice or used as snacks also. it is my favourite snack with besan & green chilli and spices. use only similar size long chillies. Subz mirch do pyaza is a spicy mouthwatering mixed vegetable recipe cooked in traditional North Indian onion-tomato based curry. Serve the delectable mixed vegetable recipe with roti or parantha. Uttappa, a famous south indian snack, which is not only favourite and famous amongst south indians but now a day’s liked and favourite amongst almost all of us. Here is new variety of uttapam, made from bajri and rice flour, topped with salad. Dnt over cook. as it would lead to blacking of the chillies...enjoy with paranthas,dal and chawal...everytime favourite..